For years, asbestos vested interests dictated national and global asbestos debates, ensuring that whatever the context and whoever the audience, the industrys interests would be prioritized. By setting the parameters of discussions and the terms of engagement, they were able to frame conversations to highlight economic and development objectives and downplay health and environmental concerns. Although expressed in different languages, their arguments were the same the world over; industry propaganda alleged that asbestos could be used safely under controlled conditions and was an indispensable resource for industrializing countries. The result of the multilingual, well-financed, global marketing strategy has been the worlds worst occupational epidemic of disease and death. Added to workplace casualties, are the increasing number of people suffering from non-occupationally contracted illnesses caused by environmental, domestic, or consumer exposures. Even in countries where governments steadfastly refuse to acknowledge their plight, the names and faces of the injured are becoming known. 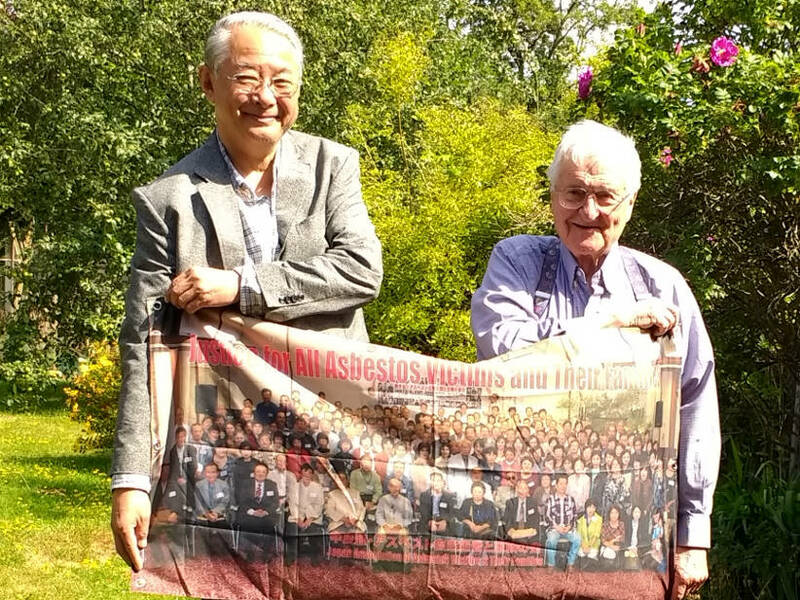 With the support of campaigning asbestos victims groups and the use of 21st century media platforms, the invisibility of the worlds asbestos victims, which had for decades enabled industrys dominance to go unchallenged, has ended. Over recent weeks, it has become ever more clear that cross-border initiatives amongst victims groups have become something of a global phenomenon. The challenges presented by national borders, far-flung time zones and different languages have been overcome, as a result of which collaborations on joint initiatives are flourishing as are transfers of successful campaigning and outreach strategies. A few examples of events which took place over the last few weeks are informative. On June 30, 2017, members of the Hampshire Asbestos Support Group (HASAG) held an Action Mesothelioma Day (AMD) event in Portsmouth. Every year, HASAG raises a huge amount of money for mesothelioma research on this national action day; this year, they raised �30,000, the most ever. Lynne Squib, co-founder of HASAG, relating to members news of current achievements and future plans. Also taking part in the HASAG event was Dr Gregory Deleuil, the medical advisor to the Asbestos Diseases Society of Australia. In the last 30 years, Dr Deleuil has arguably treated more mesothelioma patients than anyone in the world. 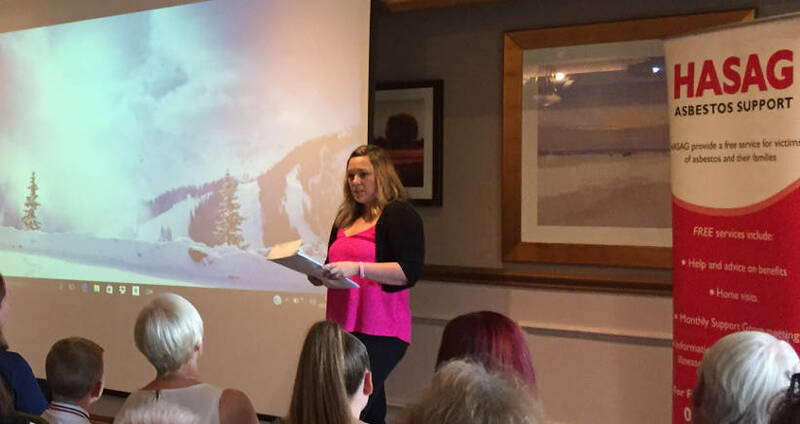 His presentation to HASAGs supporters, which was entitled: Full Circle, explored his personal and professional journey, which included the loss of his mother to the signature asbestos cancer, mesothelioma. 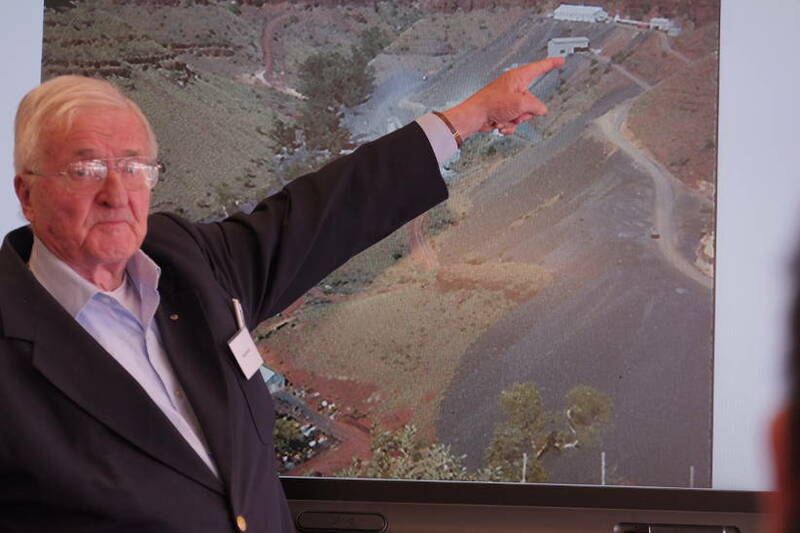 With his inestimable wit and unrivalled knowledge, Dr Deleuil brought something of the Australian outback with him to Portsmouth; his description and photographs showing the aftermath of Cyclone Tracy (1974) and conditions at the notorious Wittenoom blue asbestos mine causing some gasps of astonishment from the audience. We didnt get a good picture of Dr Deleuil making this presentation, but below is a picture of him making a presentation on a similar topic the following week in Manchester. 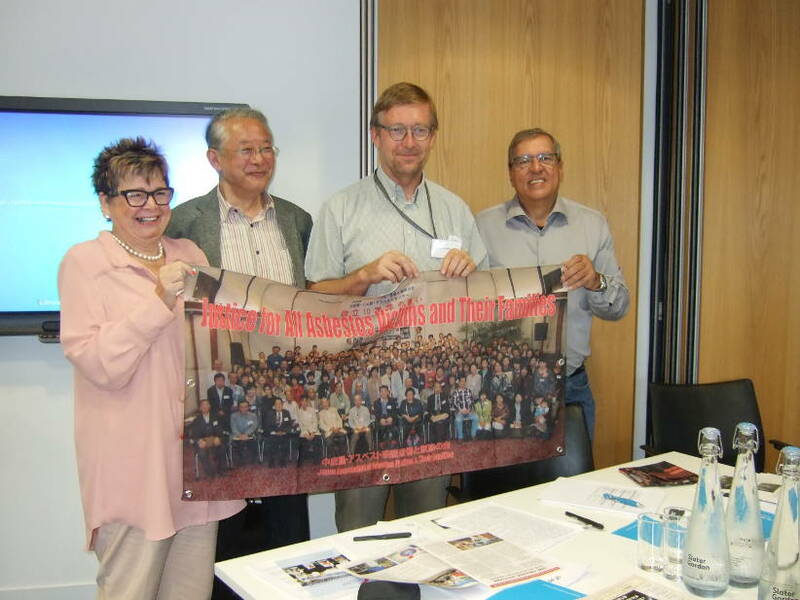 On July 4, 2017, in a gesture of solidarity, Sugio Furuya of the Ban Asbestos Network of Japan presented Dr Deleuil with a banner calling for Justice for All Asbestos Victims and their Families at a meeting in London. Sugio Furuya and Dr Deleuil with the banner. This same gift was bestowed upon the leaders of UK, French and Belgian groups at an International Asbestos Study Day in Manchester (July 5) attended by a delegation of 20 Japanese asbestos victims, family members and campaigners as well as by Spanish, Belgian and French delegates. 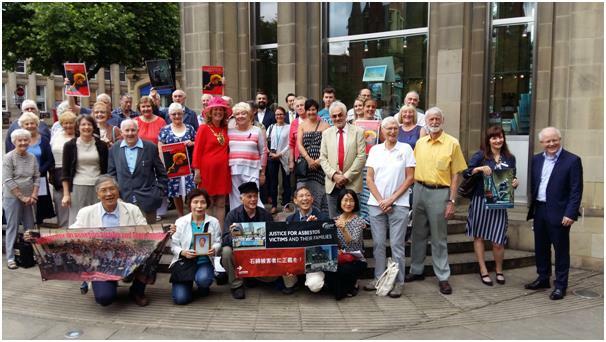 Two days later, on July 7, Japanese delegates attended Action Mesothelioma Day events in Manchester, Birmingham, Liverpool, Derby and Sheffield. Action Mesothelioma Day event, Sheffield. 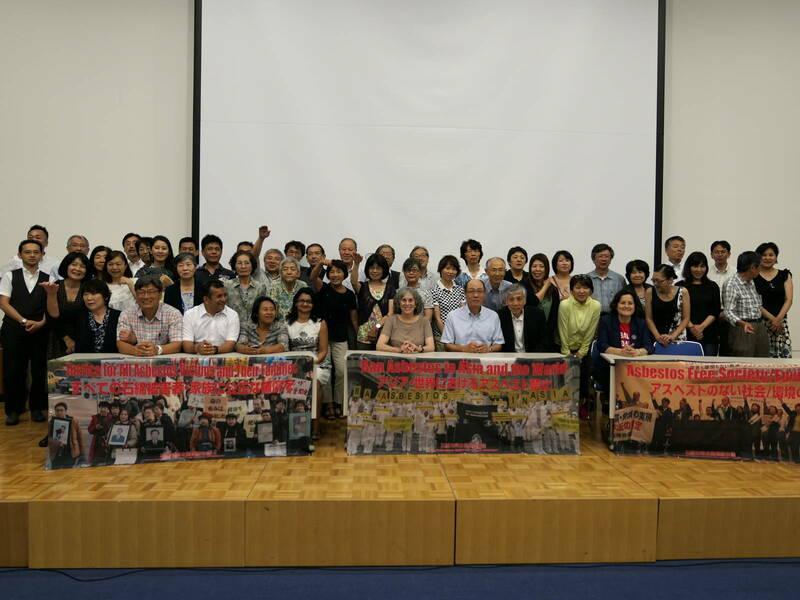 On July 15, 2017, Ban Asbestos Japan (BANJAN) marked its 30th anniversary with an activity attended by more than 300 BANJAN members entitled International Conference towards a Ban on Asbestos in Asia and the World at the Tokyo Institute of Technology. 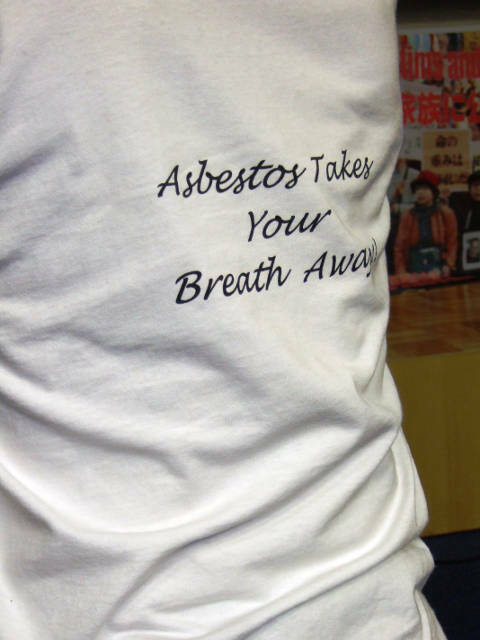 The apparel worn by the events facilitator Sugio Furuya  a tee shirt from the Greater Manchester Asbestos Victims Support Group with the slogans Justice for Asbestos Victims on the front and Asbestos takes your breath away on the back  referenced his participation in the Japan Solidarity Mission to the UK earlier in the month. 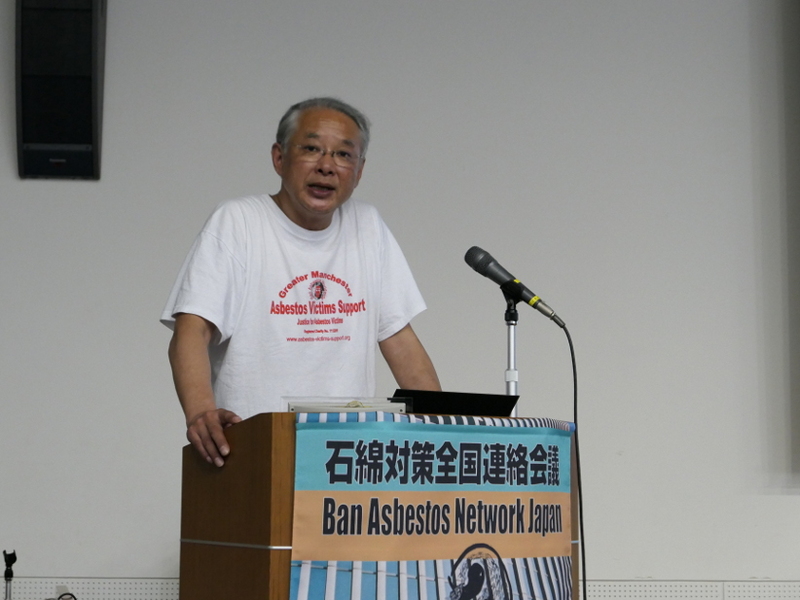 Sugio Furuya wearing tee shirt from Greater Manchester Asbestos Victims Support Group at Tokyo event. Sugio Furuya wearing tee shirt from Greater Manchester Asbestos Victims Support Group at Tokyo event  back view! International speakers at the conference included Kate Lee from Australias Union Aid Abroad (APHEDA), Indonesian trade unionist Wulan Sri from the Building and Woodworkers International, Omana George from the Hong Kong-based organization the Asia Monitor Resource Centre, Sanjiv Pandita representing Solidar Suisse and Laurie Kazan-Allen from the International Ban Asbestos Secretariat. Group photo of international speakers and some of the delegates to the Tokyo conference. Amongst the most affecting presentations was that of Mr. Kazuo Miyajima, a building worker who contracted asbestos-related lung cancer after years of hazardous exposures at construction sites. Following an operation in 2003, he suffers from severe shortness of breath and relies on oxygen therapy and a cocktail of medicines to manage his illness. He expressed his whole-hearted commitment to the ongoing litigation on behalf of construction workers; a crucial Tokyo High Court verdict is expected on October 27, 2017. 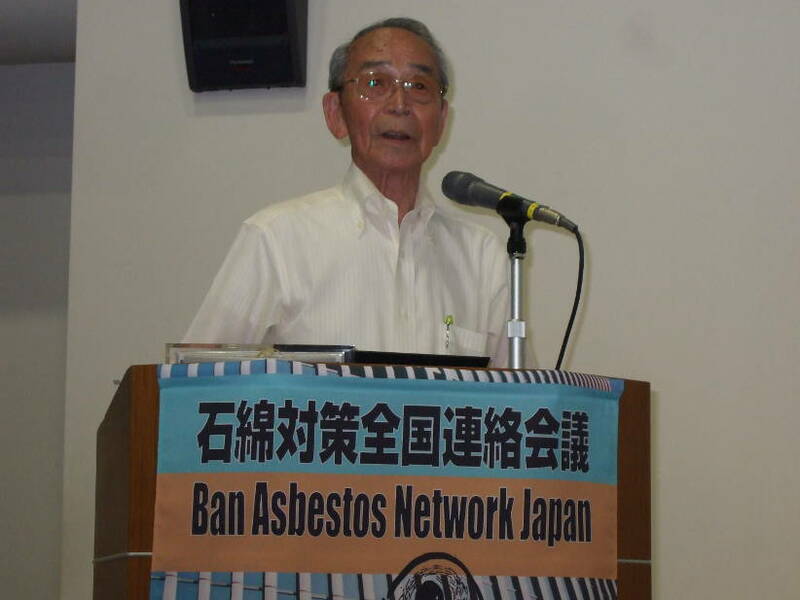 Paying tribute to the lawyer Mr. Toshio Yamashita who pioneered the construction workers asbestos lawsuit but has since its inception passed away, Mr. Miyajima said he longs for the day when he can make a pilgrimage to his grave to tell him that the case had been won. 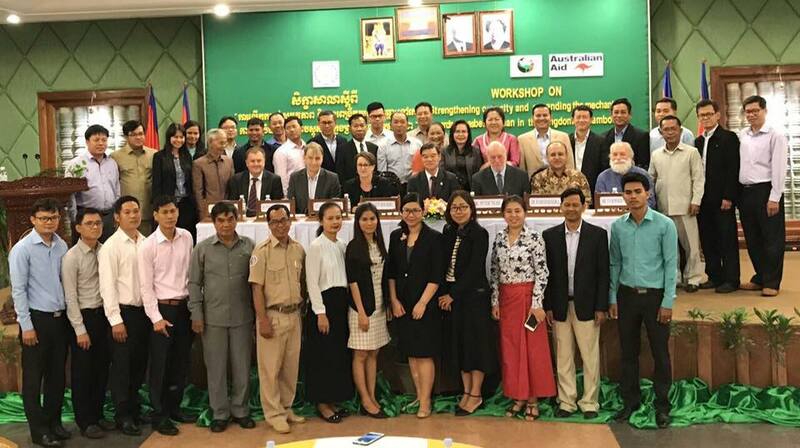 On July 20-21, 2017 representatives from another Mekong government and civil society groups will engage with Canadian, Australian and Japanese experts in discussions regarding national asbestos legacies, the implementation of strategies to protect public and occupational health from toxic exposures, the availability of asbestos-free substitutes, and economic, social and political issues involved in a just transition from an asbestos-based economy. Throughout the Mekong Region there is a pronounced rise in concern over the repercussions of toxic asbestos exposures. 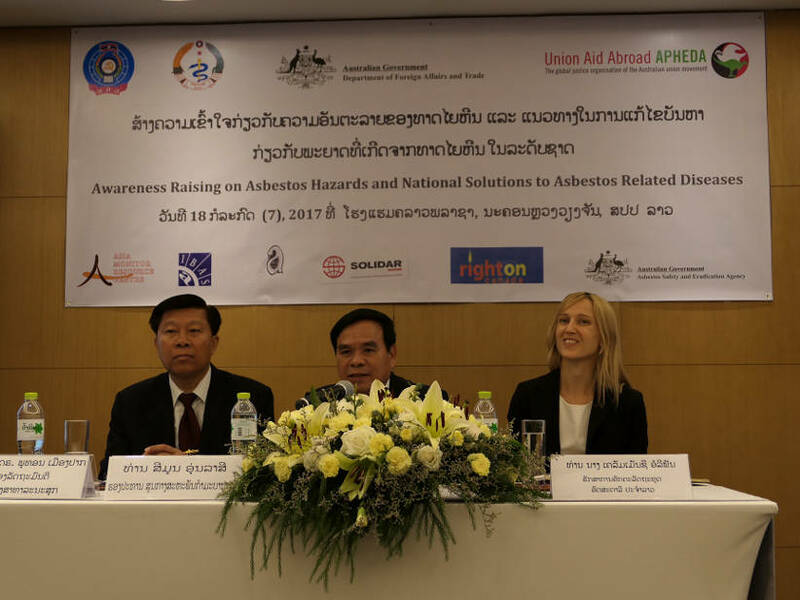 The input from global experts during the events which took place this month has helped quantify the hazards posed by continuing asbestos consumption and provided independent data and updated information to validate the introduction of policies ending asbestos use. As we in the UK have learned full well, a ban is only the first step towards ending the environmental and social injustices caused by asbestos. The achievement of an asbestos-free society is a long-term goal that must be informed and steered by asbestos victims and their families. The struggle continues!